Aboriginal designer Colleen Tighe-Johnson is a recent recruit to the University of New England’s SMART Region Incubator, which is a member of the Jobs for NSW Local Innovation Network, and has quickly realised its potential to grow her fashion business internationally. 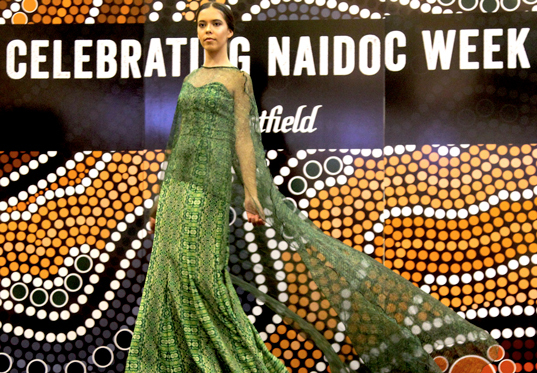 Ms Tighe-Johnson, based in Tamworth, is the founder of Buluuy Mirrii Designs which showcases Indigenous creativity by harnessing the spirit of the ‘Gomeroi Dreaming’ on haute couture international runways. As a Gomeroi woman and fashion designer, Ms Tighe-Johnson is using her talents to revive Gomeroi Dreaming Stories through design. Gomeroi artworks are transformed into fabric patterns by a graphic designer, printed on luxury fabrics and sewn into one-off garments. Ms Tighe-Johnson’s designs are then showcased in runway shows, backed by soundtracks and voice overs which tell the stories behind each garment. The Buluuy Mirrii (Black Star in her Gomeroi language) label has been featured on runways in Melbourne, New Zealand, Canada and New York Fashion Week as well as the Cannes Film Festival and Paris Fashion Week. Last year, Ms Tighe-Johnson won the NSW Emerging Creative Talent Award at the 2018 NSW Creative Achievement Awards. Now Ms Tighe-Johnson is planning to move into the ‘ready-to-wear’ fashion market and focus on her label fulltime. “I joined the UNE SMART Region Incubator last October to get assistance,advice and mentoring and peer support, especially on business strategy and sales,” Ms Tighe-Johnson said. “My vision is about sharing my cultural heritage and stories through art and bringing them to life on textiles and the incubator will help me to achieve my goals. “The peer mentoring you get there and the help in understanding different aspects of business is significant. It has also given me access to local startup networks and other opportunities. “I think it’s a great idea for other business people to also get involved with the incubator. Just having support mechanisms to help you deal with challenges that crop up is a great thing. UNE SMART Region Incubator community manager Sue-Ellen Hogan said the Local Innovation Network is about helping regional entrepreneurs like Ms Tighe-Johnson. “Colleen does beautiful amazing designs and has done shows around the world but is now bringing her product to market,” Ms Hogan said. “Colleen has participated in our Expert in Residence program and is meeting monthly with our expert in residence Gary Morgan, Founder and Director of MPT Innovation Group, who offers individualised advice. Jobs for NSW CEO Nicole Cook said the UNE SMART Region Incubator was one of seven organisations providing support to startups across the Local Innovation Network which is operating in regional locations including Armidale, Byron Bay, Bathurst, Coffs Harbour, Newcastle, Wollongong and Wagga Wagga. “The Local Innovation Network (LIN) is a $2.1 million commitment by the NSW Government to develop regional entrepreneurship and support startups and small to medium enterprises (SMEs) across the state,” Ms Cook said. “The LIN is helping develop entrepreneurs in each of the seven regions by removing barriers that isolate startup founders from each other and by linking them with the Sydney startup community through the Sydney Startup Hub and its Regional Landing Pad. “The Sydney Startup Hub celebrates its first year anniversary this month and in the past year its Regional Landing Pad has hosted 1,072 meetings involving entrepreneurs from regional NSW. “The Regional Landing Pad offers free startup space for regional entrepreneurs based outside Sydney, Wollongong and Newcastle. Regional entrepreneurs can visit for up to three days at a time to meet with other startups and potential business partners, investors, and service providers. For further information and contact visit Local Innovation Network. For further information on the Sydney Startup Hub’s Regional Landing Pad and to book a free visit Sydney Startup Hub.